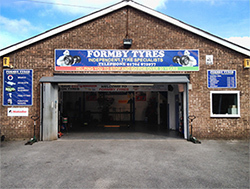 At Formby Tyres we combine skill with integrity resulting in tyre dealing of the highest standard. Together we have over 80 years of experience in the workshop! FREE 123 on EVERY new tyre supplied by us! Use our online service to order your tyres today. Just enter your reg number and we'll automatically find the right tyres for your vehicle. At Formby Tyres we specialise in prestige, performance and 4x4 tyres but our tyre stocks cater for all markets - budget, mid-range or premium. We stock a wide variety of tyres from all the leading brands and any that we don’t stock we can easily obtain. For a competitive quote for tyres please call in for a free tyre pressure and tread check or give us a call on 01704 872977. For more information call Formby Tyres today on 01704 872977, call in for your free tyre pressure and tread check or email us at formbytyres@yahoo.co.uk. Make Formby Tyres your first choice for prestige, premium and 4x4 tyres.